I have a rolodex of terrible first dates; I blame my younger self for being such a glutton for punishment. Nonetheless, for those of us that do experience the occasional crappy date, we tend to take away something from the experience. Most often than not, I remember the food (in this case: the Crème Brûlée) more vividly than the guy— I suppose that’s how it should be. One of my terrible first dates began like this… He picked me up from the train station and drove me around town. As if being a year older than him didn’t make me feel terrible enough, I felt as though I was stuck in between the pages of Driving Miss Daisy (I was Daisy, obviously) and a soap opera about surreptitious love. Our first date was not of the norm. We arrived at a gorgeous French restaurant with an oceanfront view and doormen with paper-white smiles. From the corner of my eye, a woman walked briskly towards us, “You’re late!” I was so confused. She wore an oversized black gardening hat, Louboutin heels, and a scarf made from the tears of a thousand cherubs. Her handbag was an unusually shaped piece, made from questionable leather. It was his mother. She was tall and lissome— her skirt fit her like a glove and she walked with more confidence than runway queen, Naomi Campbell. I was having lunch with Jane Fonda’s doppelgänger. We were lead to our reserved table outside; I could taste the salt in the air. I felt like I was in a dream; or was I in a nightmare, dressed like a daydream? I looked at the menu, “Oh, wow, it’s really French here!” She nodded acerbically. I could already tell this date with Mom was going to be a mess. Her son offered to help me translate what was on the menu; I shook my head and insisted I was fine. After a few minutes of internal frustration, and stubbornness to employ his expertise in a language that I did not speak, I settled on what I did know of: Chicken Fricasseé— a grandmotherly choice, but a safe one. Both mother and son rhythmically bombarded me with questions as I awkwardly shoveled food into my mouth. At one point he asked, “Do you see us together in five years?” It was our first date; I couldn’t even remember if I’d put on deodorant before I left my house! I stuffed my mouth with so much chicken that even the carcass felt bad for me while I was put under the spotlight. After many compliments and a prodigious amount of prayeer on my part, our server arrived. He relieved us of our plates, saved me from another awkward question, and carefully left the dessert menu on the table. Like in every respected French establishment in America, I was notified that the restaurant housed the best Crème Brûlée in all the land. We each ordered one. The dessert came out with a side of gorgeous crimson red strawberries. This was my second time experiencing this bourgeois dessert, and I was glad I didn’t have to pay for it. We synchronously tapped through the calico yellow and earth-colored sugar shell, piercing through to the silky vanilla-scented custard below. It was the only marvelous part of the date. With each spoonful, I felt as though chanting Buddhist monks sat beside me and realigned my chakras. The custard was perfectly rich, kissed with the right amount of vanilla, and the caramel shell glistened like stain glass windows in an old Spanish church. I wish I could wax and wane poetic about the date; it will forever go down as one of the most awkward moments of my life. Mother and son go on date with prospective boyfriend… Is out-of-this-worldliness a requirement of eating Crème Brûlée? 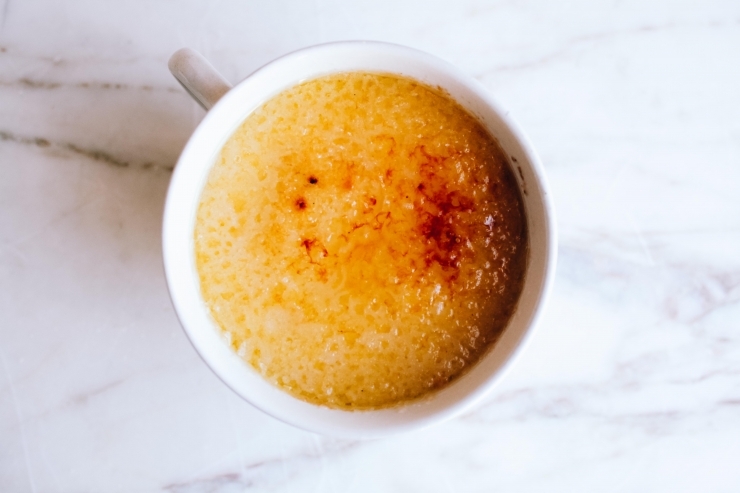 Why can’t Crème Brûlée be easy, laid-back, and ask of you to enjoy it while watching back-to-back episodes of Bob’s Burgers in your underwear?! Well, let’s change that. As much as I love Crème Brûlée, the high-maintenance mom at the high-maintenance oceanfront restaurant threw me off and gave me a whiff of reality. 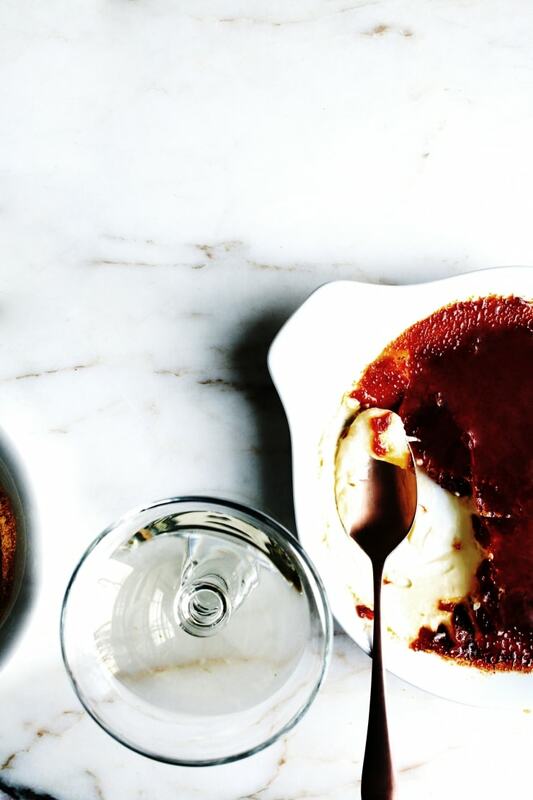 Crème Brûlée (also called Burnt Cream) is just cold custard with a quick-caramel shell, yet we’ve been deluded to understand that it’s more sophisticated than it really is. Vanilla custard with caramel shouldn’t be left for an expensive pair of heels and an LBD at a fancy-schmancy French restaurant, as far as I am concerned. 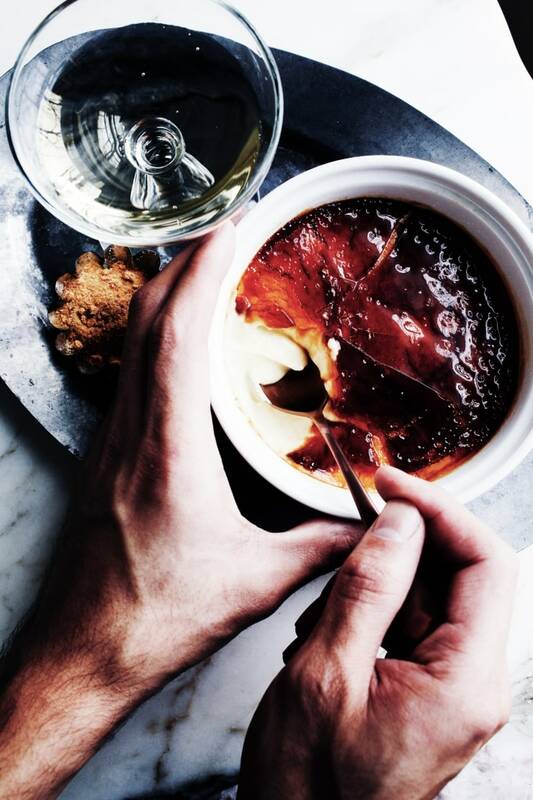 The most important part of the Crème Brûlée experience, aside from the taste of the custard, is the moment of breaking into the caramel shell. I sought out to test various forms in which a person can make Burnt Cream, without any of the fuss that makes this dessert only appropriate for special occasions and awkward dates with the mom of the dude you’re dating. My only requirements: a velvety custard and an approachable method to make the caramel shell without a headache (translation: no torch). First, the custard. There is a great deal of hullaballoo in cookbooks, forums, blogs, and television shows about how Crème Brûlée custard should be cooked. Some swear the custard should never be made in a saucepan, and others insist that Crème Brûlée custard mustn’t be caressed by the heat of an oven. The late Julia Child made hers in a saucepan with a bit of cornstarch. Chef Gordon Ramsay is famous for making his Crème Brûlée in the oven, in a bain-marie, later unmolding them like a Crème Caramel. The saucepan method seems classical and more practical, in my mind. The bain-marie method seems dauntingly perilous, though it does create a fantastic dessert nonetheless. 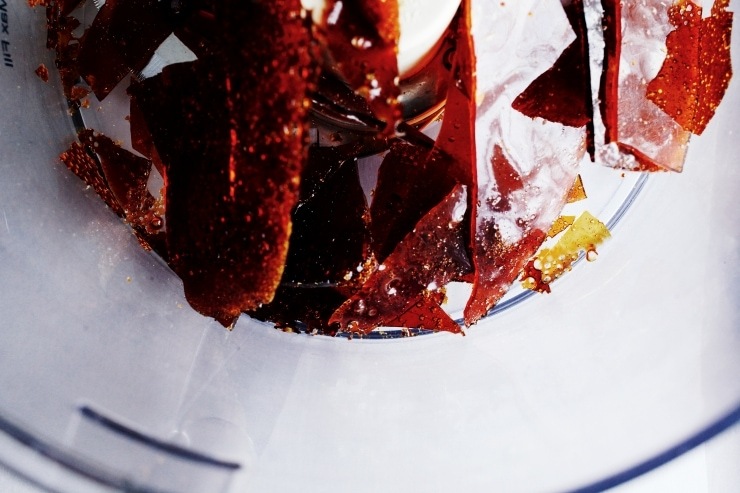 There’s no doubt that the latter method creates an ethereal custard— both methods do. However, boiling water in a large roasting pan surrounding little pots of daffodil-colored cream is asking for a reenactment of a number of twisted scenes from American Horror Story, of which I am not willing to do (or encourage, for that matter). 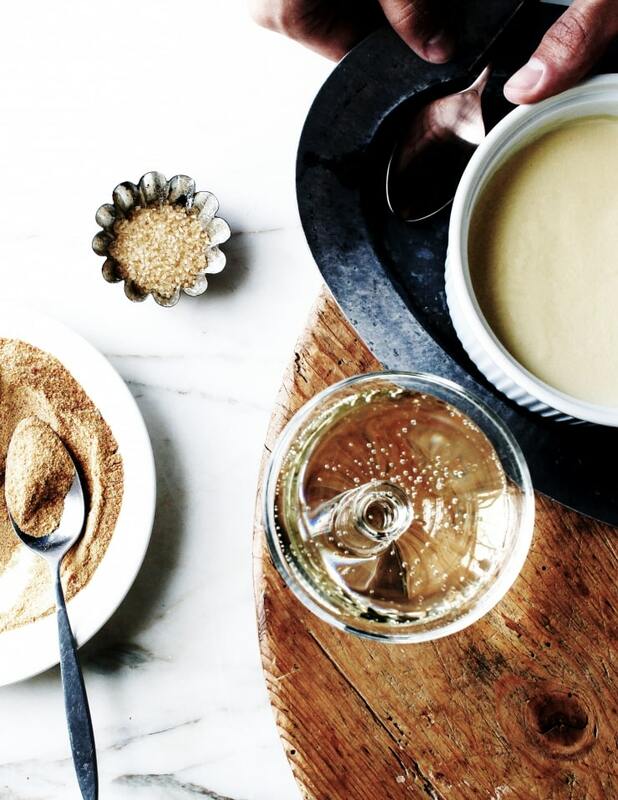 My grandmotherly senses implore me to encourage you to stick with the saucepan method— it’s more laid-back, less dangerous, and creates a luscious, unctuous custard that can conveniently be placed into various size containers of your liking (a mini soufflé dish and gratin dish, here). Now, I’ve to be honest; as inexpensive the ingredients can be for this dessert, regardless if you’re making the custard in the oven or over a flame, it can be a slight labor of love. When using your oven, you must take the utmost care to not injure yourself with the walls of your oven or worse— the boiling water. On the stovetop, you must baby your custard and stir it religiously, otherwise you’ll be left with a grainy custard that is likely to split. 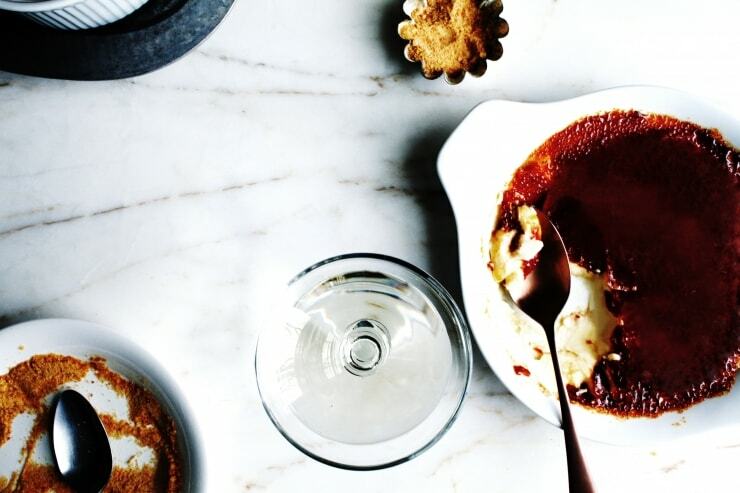 Crème Brûlée, obviously, isn’t only about the custard— the caramel shell is what makes it. However, when fire is involved, things can get a bit scary. Besides that, let’s be real— a kitchen torch can be an expensive investment, especially when making something that costs as much as a latte from your local coffee shop. The necessity for a torch, most importantly, turns people away from making Crème Brûlée. Many chefs, bakers, and everyone of the like, insists that a simple dusting of white sugar on the custard, and a short stint under the broiler will do the trick if you do not have a kitchen torch. As much as I’d like to standby that method, it can often result in a less-than-decent caramel shell (Example A) and warm, sometimes separated, custard. 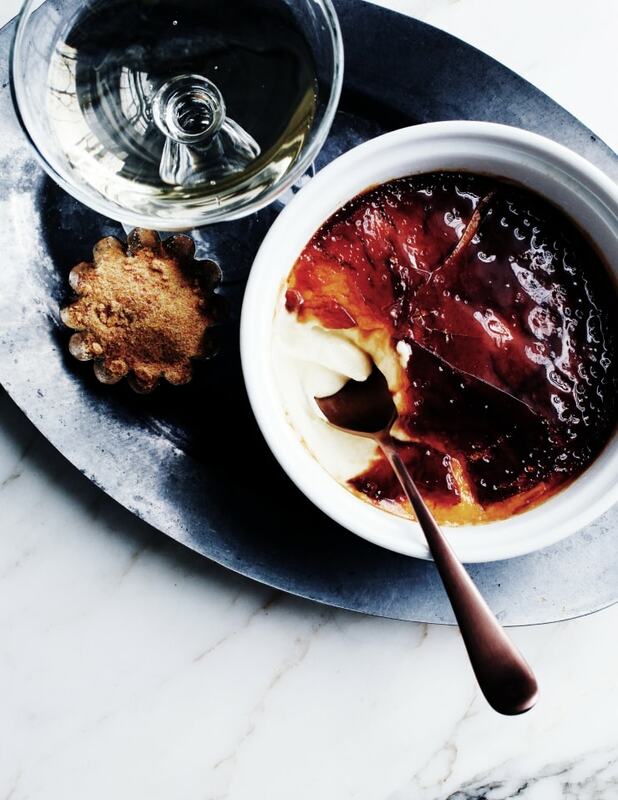 All classicists will agree that Crème Brûlée is all about the juxtaposition of the cold velvety custard and the crackly, warm amber caramel top. The broiling sugar method can work, but it’s fussy because it all depends on the intensity of your broiler. That is, until now. After much research and experimentation, I’ve devised a broiling method that works every time and it doesn’t take away from the proper Crème Brûlée experience (be it for a romantic dinner, or for watching trash television with your beau). You’ll get beautiful amber tops and you don’t need a torch; it’s magical. If you want to use a kitchen torch, however, go for it– I did for the one in the mini soufflé dish, and the other was placed under the broiler. As it goes, it all begins with the cream, milk, and vanilla in a saucepan. All three are heated until just below boiling point. Bubbles form around the circumference of the mixture, signaling to be removed from the heat. 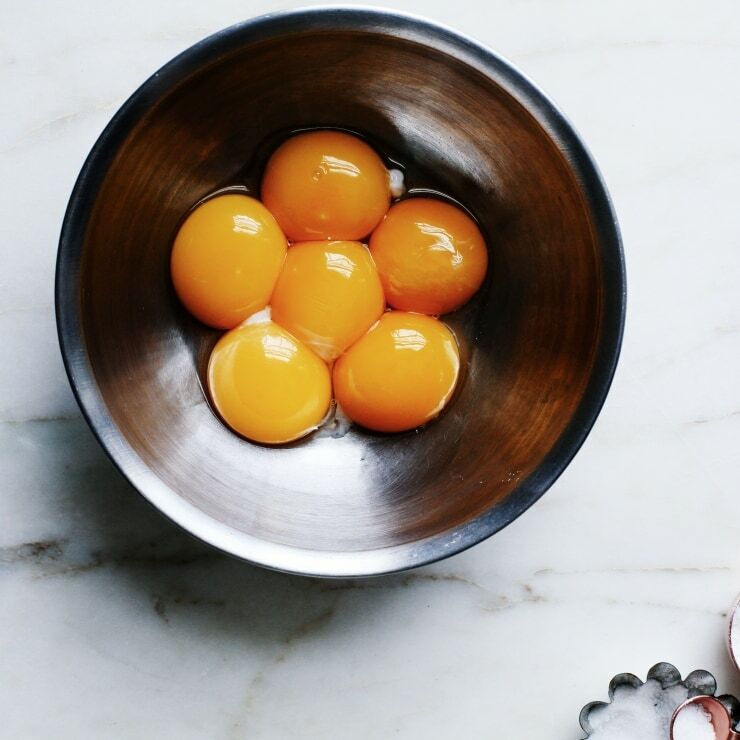 Once that’s done, sugar, cornstarch, and salt are introduced into a bowl of six sunrise-colored egg yolks, and they’re briefly whisked together until smooth. Here’s where things get fun— a scant cupful of the vanilla-scented cream mixture is cautiously poured and vigorously whisked into the egg yolks. Once that’s done, the just-sweet-enough blonde mix of eggs and cream is poured through a fine-mesh sieve into the warmly-scented saucepan of waiting cream. The whole lot is whisked together, then stirred, and heated on a very low flame for about three minutes, until thick and viscous like honey. Too much time on the heat will cause the mixture to split, so some care is essential! Once cooked through, the custard is immediately poured through the fine-mesh sieve into a waiting jug, and then into heat-proof dishes. The custards are then left to cool inside the refrigerator, uncovered (this allows a skin to form, therefore making it easier to brûlée the tops) for a few hours until cold and no longer jiggly. While the custard is cooling, the easy part happens. The caramel. The oven is heated up and a parchment-lined baking sheet is covered in a blanket of granulated white sugar and placed in the oven for about 15 minutes, until the sugar is melted and amber-colored. After the caramel block has cooled, it’s broken into pieces and pulsed in the food processor until fine and powdery. Making the caramel ahead of time, and processing it into a dust, is kitchen witchery at its best. 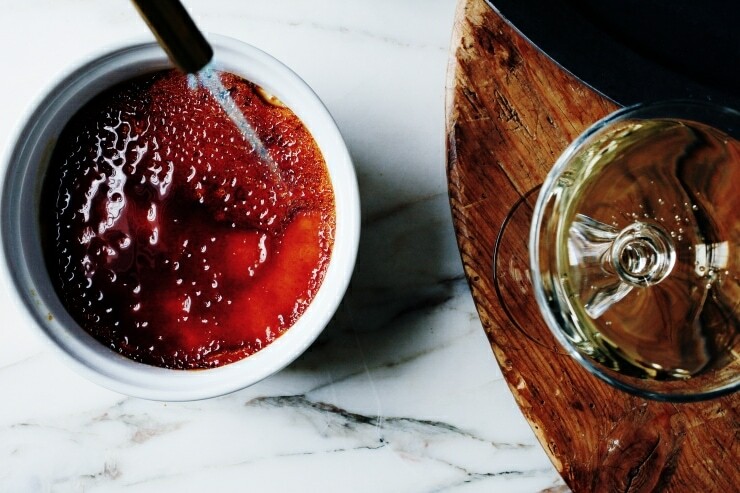 Now, let’s talk about brûléeing (caramelizing sugar on Crème Brûlée custard) for a second, shall we? 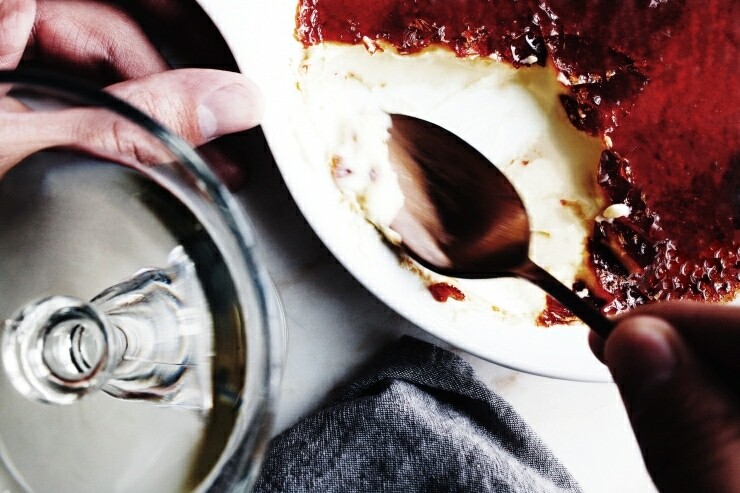 The classic method for burning white sugar on Crème Brûlée requires the assistance of a torch; the top ends up crackly and unevenly browned, and the flavor of the caramel is sweet and bitter in flavor. The custard beneath is unscathed and perfectly creamy. When the caramel sugar is heated with the blowtorch, the caramel is immediately remelted and browned to almost-even perfection. The flavor of the shell is similar to that of toffee, with a slightly bitter flavor; the custard below is still cold and as smooth as can be. How did the caramel sugar perform under the heat of the broiler? When the caramel sugar is broiled on top of the cold custard, it requires no more than 40 seconds underneath the broiler to remelt the caramel. The caramel melts into a perfectly even shell that is sweet and flavorful like toffee. The custard below is still cold and unspilt, unlike the one made with the white sugar. The results speak for themselves. No more will you have to experience awkward dates, or endure painful checks, at French restaurants just to have Crème Brûlée. Burnt custard needn’t a trip down the isles of Home Depot for a blowtorch. All you need is some caramel sugar and the heat of your broiler to turn your Netflix and chill sesh into a delicious experience. 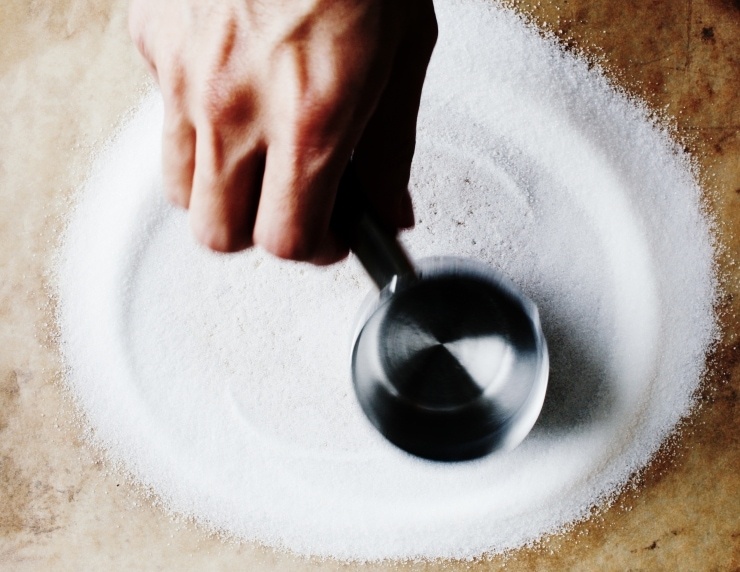 When it comes to making the caramel, I stick to what most people have at home— granulated white sugar. It works the best. 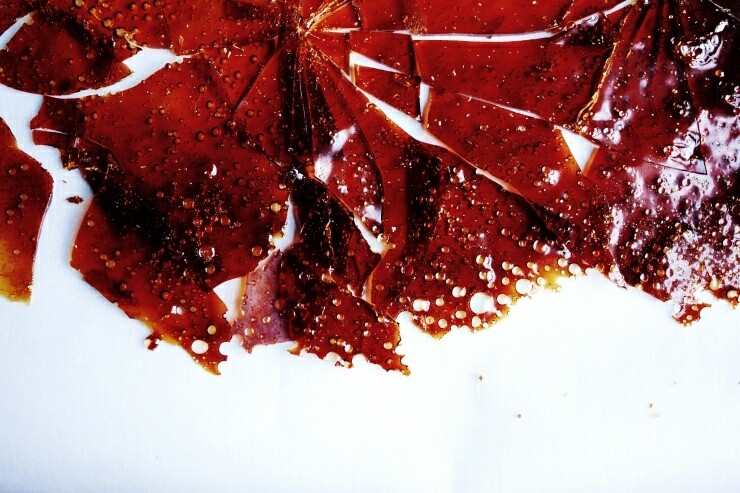 Demerara sugar and Turbinado sugar (sugar in the raw) are also favorites of Crème Brûlée eaters, as they give more toffee flavor and bitterness to the dessert. If you’d like to make the caramel sugar with either of those sugars, you’ll want to check the caramel after 10 minutes in the oven (and every minute thereafter, until the sugar has melted and browned). Do keep in mind that it’s crucial that you do not allow the custard to come to a boil, as the custard will split. 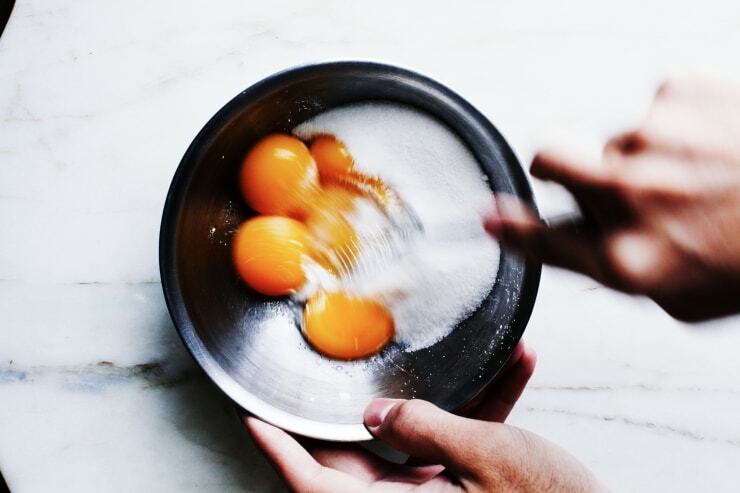 Split happens (sorry, I couldn’t help myself)— take the pan off the heat and vigorously whisk in a cold egg yolk. 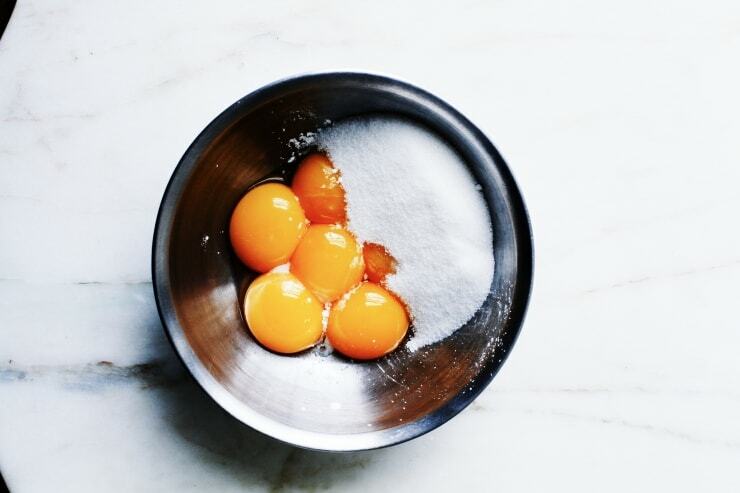 The cold egg yolk will help cool the split custard and bring everything back together. Just be sure to sieve the salvaged custard immediately into a waiting bowl or jug. 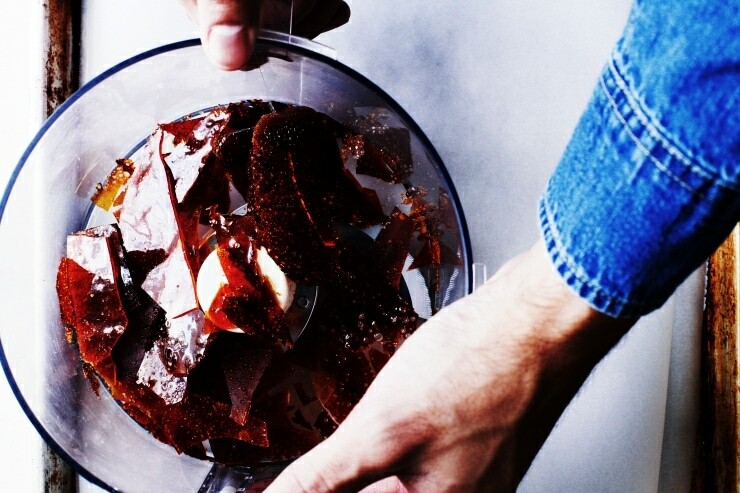 Place a fine-mesh sieve over a large heat-proof bowl or measuring jug, and set aside. You will need this to immediately transfer the cooked custard into later on. Meanwhile, make the custard: In a medium heavy-bottomed saucepan over low heat, heat together the heavy cream, whole milk, and vanilla until just below boiling point, about 3 minutes. Be sure to stir occasionally with a silicone spatula. You will know it’s ready when little bubbles form around the circumference of the cream. Turn the heat off, and set aside. 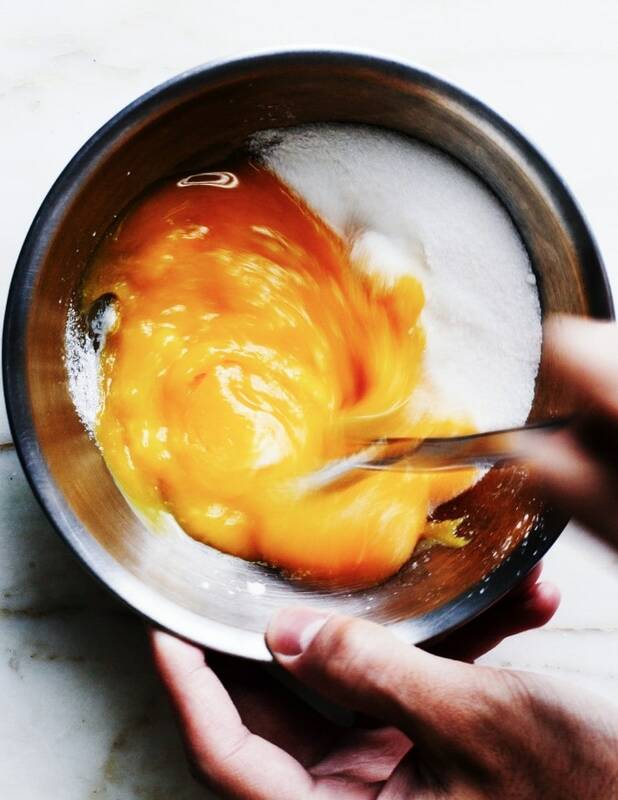 In a medium bow, whisk together the egg yolks, sugar, cornstarch, and salt until smooth. Slowly whisk in less than a cup of the warm cream mixture into the egg mixture. This is tempering the eggs; this allows you to prevent the yolks from scrambling when it hits the rest of the warm cream. Once that’s done, vigorously whisk the egg mixture into the saucepan of warm cream. Switch to a silicone spatula. Place the saucepan of yellow-tinged cream over low heat, stirring constantly until thick and viscous like honey (or when an instant-read thermometer registers about 165ºF/74ºC). Immediately remove the pan from the heat and sieve the mixture into the reserved measuring bowl. Once sieved, pour the custard into 4 (8 ounce / 240ml) ramekins, or heat-proof dishes of your choice. Even out the tops by gently jiggling the containers from side-to-side, and allow to chill in the refrigerator, uncovered for 2 hours (or until truly cold). A slight skin will form on the top of the custards, this is good; you’ll need this for when you brûlée the tops. While the custard is cooling, make the caramel: Preheat the oven to 400ºF. Line a rimmed baking sheet with parchment paper, and evenly sprinkle with the sugar. 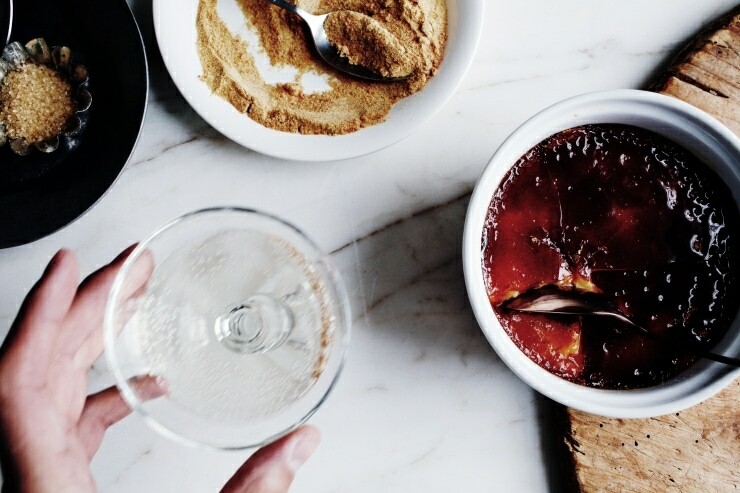 Bake for 12-15 minutes, or until all the sugar is melted and golden (Err on the side of 15 minutes, if you like your creme brûlée shell to have a deeper flavor— this will give you an amber color). Check every minute after the 12-minute mark, to prevent your caramel from burning. Set aside and allow to cool completely. Once cooled, break the caramel into shards and run through the food processor until the caramel is finely milled, about 1 minute (a blender would also work; smashing the caramel pieces in a plastic bag will work too). For Brûlée-ing the Caramel Dust underneath the broiler: When ready to serve, turn the broiler on and place the cold custards on a rimmed baking sheet. Sprinkled the tops of the cold custard with about 1/2 tablespoonful of the caramel sugar, or just enough to cover the tops evenly (the larger the dish, the more you’ll need). Gently shake the ramekins from side-to-side to even everything out and immediately brûlée the tops underneath the broiler. This should take anywhere between 30 seconds to a minute, depending on your oven. The ramekins of Crème Brûlée are ready when the caramel has melted into one beautifully even amber piece. Let sit for 2 minutes, to allow the caramel to harden, before serving. For Brûlée-ing the Caramel Sugar with a blowtorch: When ready to serve, sprinkle the tops of the cold custard with about 1/2 tablespoonful of the caramel sugar, or just enough to cover the tops evenly (the larger the dish, the more you’ll need). Gently shake the ramekins from side-to-side to even everything out and immediately brûlée the tops with a blowtorch, until the caramel has melted into once piece. Allow to sit for 2 minutes before serving. You’re back!! The site looks AMAZING, too. Well worth all that hard work :) What a genius creme brulee trick – I now want to make caramel sugar to put on everything. Also I literally can’t imagine anything more awkward than turning up to a first date and discovering my date’s mum was there. *so much cringe*. Thanks, friend! I’m so glad it’s finally done! I’m so glad I learned quickly that it’s not normal to meet your date’s mom on the first date. So odd. Kam: Your writing and your photography are always like a breath of fresh air despite the sporadicalness of your posting. I’m usually a silent follower, but when you announced on Facebook that the site was getting a “facelift” I was too excited. Well worth the wait and stunning work. So nice to learn more about you too. Please tell me you’ll be blessing our eyes with more of your stunning work and that you won’t leave us anymore. I love these stories. That date sounds like a date I’d never wish on my worst enemy lol! Penny, your comment just made my day; thank you so much! I’m so glad to be back with some content.The new design was such a labor of love, but well worth it. And oh, yes, it was pretty bad… It got better after she left, but the damage was already done. Glad that you are back. Had trouble getting the site to read chaos, love, and profiteroles…still haven’t been able to read it…never mind…it’s up!!! Haha! Glad it’s working for you. The site might be slightly slow over the course of the day, but it should be fine soon! Welcome back! This looks amazing! Oh I’ve missed you! Great blog post, terrifying story of your date. Seriously creepy. I’m sure they meant well, but at least you didn’t waste time on that relationship. I’m sure she only wanted what was best for her son… still disturbing. Thank you! And most definitely; I like to believe everyone means well– her sass trumped any amount of sassiness I’ve in my soul, which was something she accomplished immediately. I think it was the Loubies! Kam you’re back!! I’ve missed you and your work so much. LIKE A LOT. Your post made me chuckle soOoo much while I read it on my trainride home. As always your writing never ceases to impress me…. “With each spoonful, I felt as though chanting Buddhist monks sat beside me and realigned my chakras. The custard was perfectly rich, kissed with the right amount of vanilla, and the caramel shell glistened like stain glass windows in an old Spanish church.” Gosh your words slay me! Hey you are back and with one of my favourite treat! That first date btw… you made me LOL. Honestly, simply thinking about that date makes me laugh! Why, thank you! I’m sure you didn’t miss much other than– the old layout wasn’t mobile responsive. 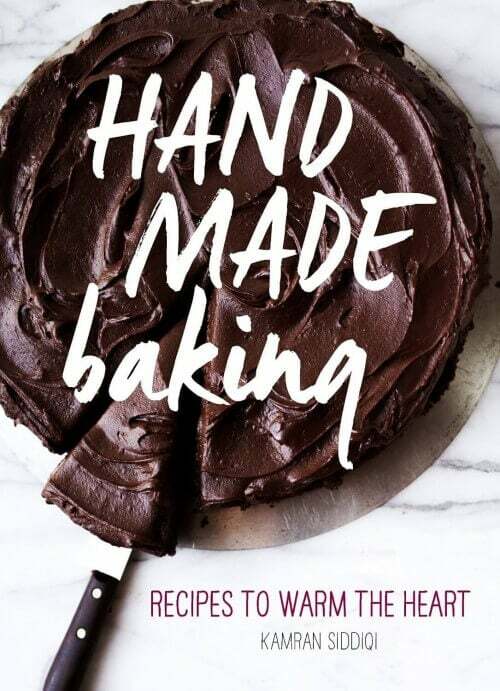 The recipe is pretty simple; so long as you read the recipe thoroughly before making it, it should be a breeze to make! So happy to see you back at this space! And, OH MY GOODNESS, don’t even get me started on bad dates, hahaha! Just be happy to know that we have all been there. 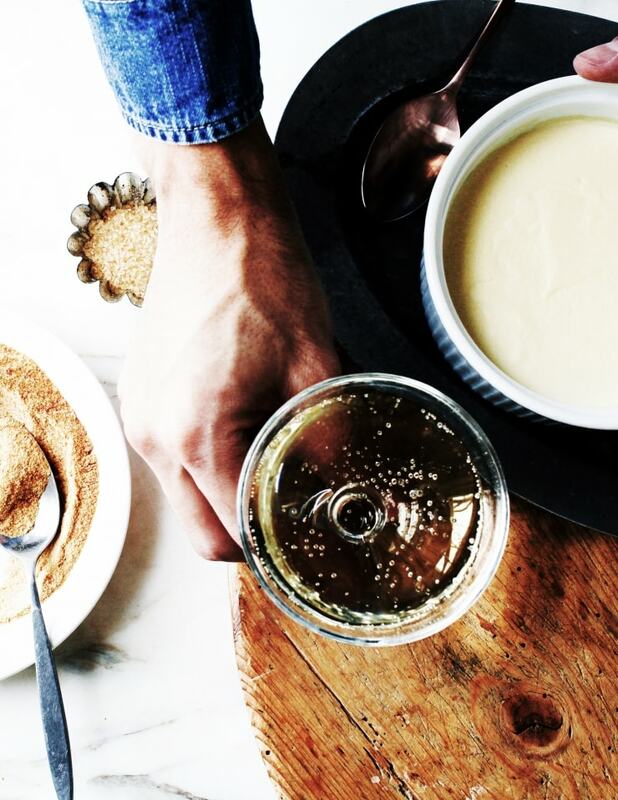 Creme brulee is one of my very favorite things in the whole world and yours looks divine! Oh, Jade, you’re fabulous. I can’t imagine the stories you’ve– when I somehow make it to your neck of the woods one of these days (or if you’re ever here), we’ll have to bond over doughnuts and terrible dates! This recipe sounds really good. I noticed you mention whole milk in the directions for the custard but it isn’t on the list of ingredients. How much should we use? Just wondering how much milk to add? You have in the instructions to mix the cream, vanilla, and milk but I don’t see how much milk to add. Hi Raven, my sincerest apologies to you and Leslie– I didn’t realized I’d left out the milk from the recipe. I’ve made the fix just now. Thanks so much for pointing this out to me! 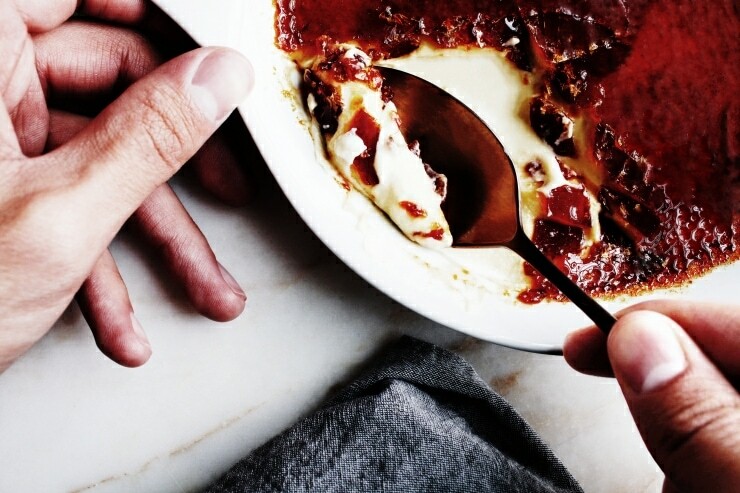 Hands down, the best creme brûlée recipe I have ever tried!! The caramelized sugar was genius and worked better than expected. It tasted even better the second day. Thank you!!! I just discovered your blog last week and love reading them. I wish I have all the time in the day to just sit and read every single one of your posts. Your writing is so enlightening, entertaining, and informational. Your photographs are gorgeous. 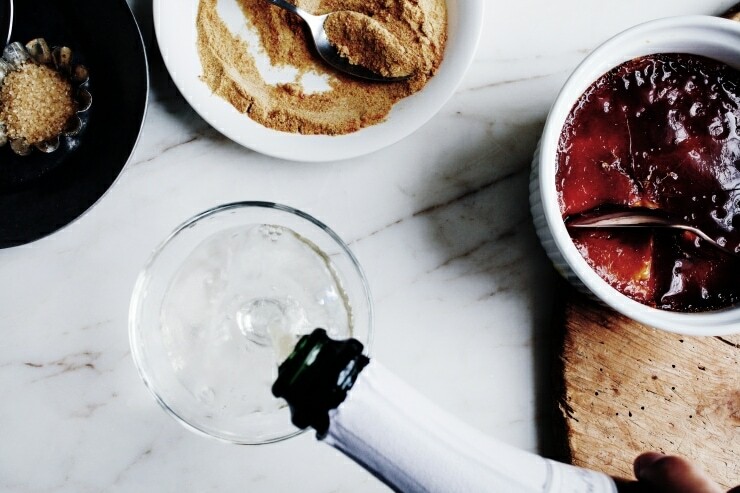 I can’t wait to make this crème brûlée. I made your NY style bagels yesterday and they turned out perfectly (and that was my first attempt at making bagels). That’s just to say your recipe was very clear and fool-proof. I can’t wait to for your book to arrive (just ordered it this morning). hi there! About how far do you suggest setting the creme brulees under the broiler? Thanks! Hi Kathleen- About 6 inches should be okay! Instead of pulverizing the sugar glass and reheating it, it is much quicker to just break it up and put it on top if the creme brulee. Hi CJ- that’d definitely work, as well. However, I find that pulverizing the sugar makes for an even top on the finished product.